This book covers the entire cycle of becoming a successful real estate investor--providing detailed information on the Why's and, more importantly, the How's.Written in an accessible format, this book provides valuable information for first time real estate investors. 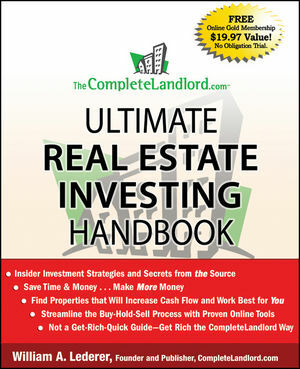 Readers will find information on: Becoming a property investor, winning residential investment strategies; assembling your team; from offer to closing; how to work on fixer uppers; owning properties as a long term investment; flipping your property and all the business details necessary to invest. William A. Lederer is Founder and Publisher of CompleteLandlord.com, the leading Web site written for and by landlords. This proven, one-stop portal offers comprehensive content, commerce, an online landlord community, and on-demand solutions that include customizable forms and letters, as well as tools for tenant screening, vacancy marketing and tenant communications, electronic rent collection, and Web-based property management. Experts in virtually every aspect of landlording, Lederer and his wife have been investors and landlords for many years. Chapter 3. Your Options: Self-Directed Real Estate IRAs, 1031 Property Exchanges, and Tenants-in-common. Chapter 6. Your Choices: Single-Family, Condo, Co-op, Vacation Home, and Multiplexes. Section Five: Fix It: What the Successful Fixer-Upper Needs to Know. Chapter 20. The Limits of Do-It-Yourself. Section Six: Hold Versus Sell: Owning Property as a Long-Term Investment.